When an attacker has entered into someone’s range closer than that of the ability to thwart them away with that of a strike, a joint-locking technique as well as a body throw or takedown is optimal. There are many cultures that discovered the ease by which to immobilize an assailant via meticulously studying the 13 major joints of the body and how they correspond to human movement. Once someone has a true understanding of each joint and its range of motion, they can effortlessly avert an attack by using minimal amounts of rotational dynamics and then employ any number of pinning maneuvers to keep them from attacking further. This program is typically sought out by those seeking a circular approach to self protection instead of that of a linear one which employs striking. By blending with an attacker’s force, one can redirect the circumstance and use very little effort at all. In this program, we exchange techniques of small joint manipulation and dorsal and lateral projection. 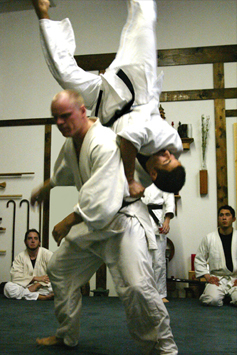 Often times, a joint-locking technique will not be as effective as taking someone’s balance by either motioning them towards any number of triangulated displacement points (points of imbalance) around the body or using proper body mechanics to scoop up or sweep a would-be adversary and then placing them on the ground. This is why we teach both joint locking AND body throwing techniques. A student of the martial arts should always be aware of any kind of potential attack and thereby train themselves to be able to provide adequate effectual defense if need be. The amount of pain that is inflicted on an opponent is exactly equal (or more) to the amount of energy used to create the initial attack. Students at the Martial Arts Center of Austin discuss in great detail teachings of physics and physiology (such as leverage, torque, rotation, elevation, depression, deflection, momentum and others) so that instead of learning a number of memorized movements, they can learn and utilize an infinite amount of offensive and defensive techniques simply by knowing the basics themselves. Once the basics have been mastered, the possibilities of combining them together allows students a freedom of endless potential to use any of the movements in any way they see appropriate. Since our two classes are completely separate of each other, we have two completely different workouts to accommodate training in each. The joint-locking/joint lock throwing class begins with a series of rolls, falls, joint stretching, and body stretches and then immediately begins with locking and throwing. This particular class deals with a more self-defense and neutralization/diffusion procedure than the body throwing class. In this class, we address numerous different locks from several different positions, number of different attackers, and in a variety of environments. Our body throwing and takedowns class is quite different. In this class, we also begin with rolls and falls, but then everything alters from there. 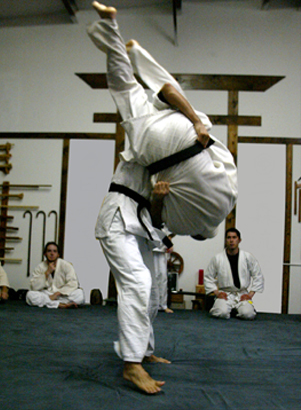 We typically follow warm-ups with throwing setups (uchi komi), and then continue with hip throws. Afterwards, we practice clinch work, high and low tie ups/escapes and then address takedowns. Regardless if you’re interested in real world self defense or sport-styled combat, this is an excellent class for either one. To the untrained eye, joint-locking and body throwing techniques seem unbelievably simple and even potentially combatively barren. But to the trained expert, joint locking/body projection and immobilization provide some of the most operative and unequivocal modes of combative doctrine attainable. This is due to the fact that to properly execute any of these tactics, a person does not need to be in perfect physical condition or perform any type of routine warm-up (as is more required of other facets of offense and defense) when preparing to defend themselves. However, this does not mean that someone should not adhere to good health and regularly practice standard procedure for any workout routine. All physical type of activities should cultivate growth in all directions mentally and physically and encourage its practitioners to always desire to seek higher levels of fitness. 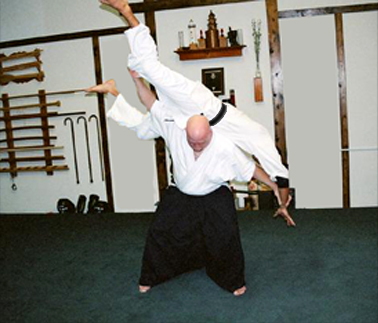 The Martial Arts Center of Austin instructs the most advanced projection and immobilization methods available anywhere. We have Master Level Instructors at our school that can assist you with all of your questions and training needs. 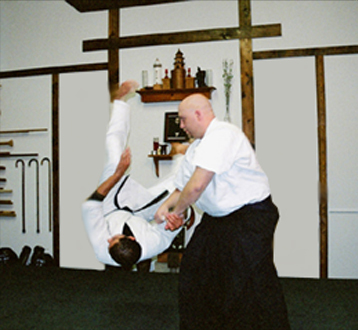 And although the techniques we teach derive from the arts of Japanese Jujutsu, Aikijujutsu and Wrestling, students of Aikido, Judo, Chin Na, Sambo, Greco Roman Wrestling, MMA, and many others will appreciate the depth of technique, exercise and opportunity in this program and feel right at home.